You were entrusted with delivering Rizdaer the Drow to Lord Ulbrec of Ten Towns for a small fee. Apparently the drow was passing himself for a half-drow in Neverwinter and soldiering for the garrison. While they did not see through his crude disguise, Rizdaer's barrack mates did not like serving with a drow-spawn of any kind. Eventually, an ugly fight broke out. By the time an officer happened by, two of Rizdaer's opponents were slain. Rizdaer was to be hanged, but at the time, the priests of Tyr were collecting the able-bodied criminals to be sent to the besieged Ten Towns where they would get a choice to fight their way to redemption or die in lieu of execution. From what he told you, Rizdaer was left for dead after a failed drow raid and survived with the help of some village kids and a farmer's wife. He seems to think that the Surfacers are little different from the drow, if more hypocritical, though he likes the notion that men have better station. There are obviously blank spots to be filled in his past. 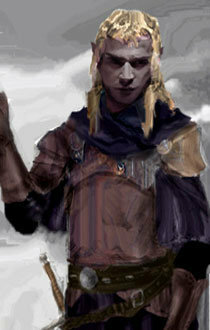 Rizdaer is strong, stubborn, brooding and more than a bit of a 'kill them all, and let the gods sort them out.' He plays a strange pride-humility game in the talks with the main character, most especially if she is a female. He will fill in some blanks for you, but there will be more, much more in his long life that you'll be only able to guess at. Rizdaer is a refugee, and has a love-hate relationship with all things on the surface. On one hand he wants to belong, on another he seems to derive dark satisfaction from not belonging.